WE ARE HERE FOREVER Arc Review: Your new best friend? 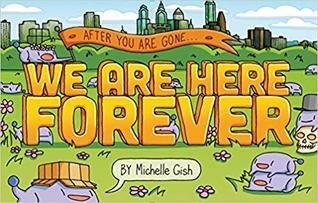 I picked up an Arc of We are Here Forever by Michelle Gish at Emerald City Comic Con. Quirk Books also had Michelle stop by and sign some books! It was great to meet her at the signing. I fell in love with the cover art immediately, and I am so glad I found this comic!!! How could you not fall in love with this cover!? A hilarious graphic novel in which the human race has been supplanted by a sweeter, kinder, happier species…but are they as innocent as they seem? In this post-apocalyptic comedy, it’s survival of the cutest! After the most adorable apocalypse ever, the human race has vanished from the earth, replaced cute, innocent, playful purple creatures called the Puramus. In this hilarious and epic graphic novel, short interlocking stories follow the purple pals as they explore their new home, form a mini-monarchy, and develop a modern society on par with 21st-century humans. A final act pulls us across time and space in the search for clues to the origins of the Puramus. Along the way, humor and intrigue abound: Can King defend his village when nobody understands what war is? Will Jingle work up the nerve to read her poetry at open mic night? Will Puff Puff ever stop floating? Based on the viral Tumblr comic that gained 18,000 followers in just one year, We Are Here Forever is for fans of post-apocalyptic sci-fi blended with dry comedy and undeniable cuteness. Colorful and cartoony art will you rooting for these cute critters through their absurd adventures. But where did they come from, and what happened to all the humans? We are Here Forever began its life as a webcomic, and this graphic novel does not hold the full story. However, having no prior knowledge of the webcomic, I felt that I was fully capable of enjoying and loving these funky purple critters. They are full of so much life and emotion, I found myself laughing on every page. I think this is a great example of an all ages comic. There are some lessons that are great for somewhat younger readers that are important reminders for older readers. This story also asks some big questions about the nature of humanity, and why we can’t seem to get our acts together and coexist. If you are looking for a new graphic novel to add to your TBR I highly recommend We are Here Forever! It goes on sale on July 30th, and I can’t wait for more readers to fall in love with the Puramus. Follow me on Twitter and Instagram for more of my bookish thoughts!